Few showers possible today across PEI with temps turning much cooler late this afternoon. 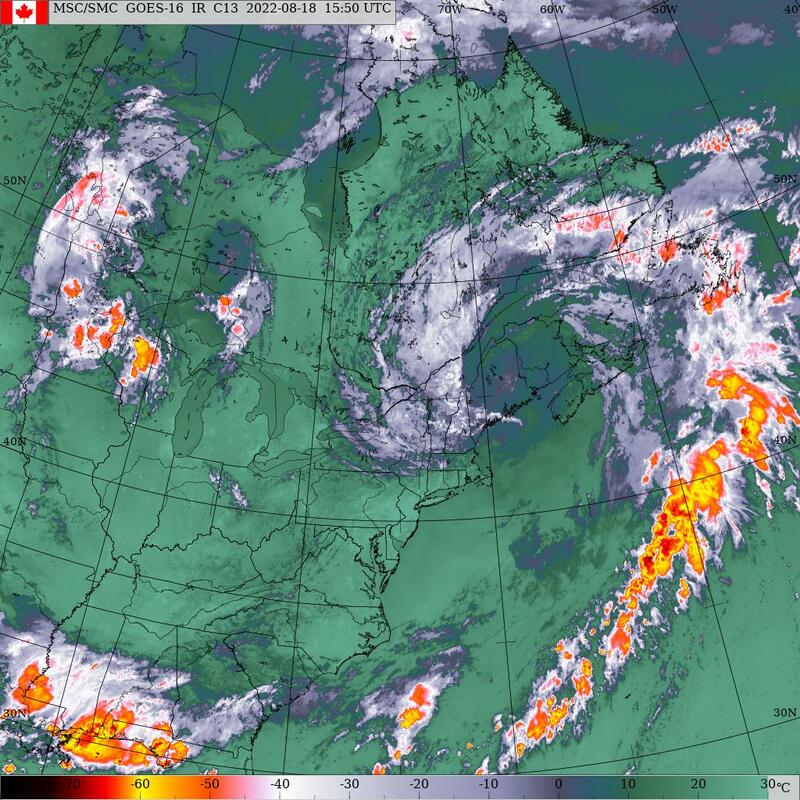 Friday May 19th 6:25am.. A low pressure system located in the central Gulf of Saint Lawrence this morning will move eastward today to be located in western Newfoundland this evening. A strong cold front extending WSW from this low will sweep eastward across the Maritimes today crossing PEI mid/late afternoon. Clouds and a few showers/thundershowers may occur ahead of the front. Temps will also climb into the low 20’s ahead of the front on SW winds. The frontal passage will see a wind shift to the NW this evening followed by a marked cool down. The low pressure system continues to move into eastern Newfoundland tomorrow with the NW winds increasing to brisk-strong across PEI as high pressure builds in from the west sliding by to our south my late Monday afternoon. This will result in a sunny but cool and blustery weekend across PEI. Next week appears to be somewhat unsettled as a couple of low pressure systems move across the island. Precipitation.. Showers possible today, dry for the weekend into Monday then rain likely on Tuesday then again on Thursday. Temperatures.. An unofficial high temperature record was set yesterday in Charlottetown of 25.4 beating the old record on 25.0 set in 1963. Temps will be warm again today but an approaching cold front will which will sweep across PEI during the mid/late afternoon will bring an end to the warm weather with below normal temps expected tomorrow and Sunday for PEI. There may be a one day warm-up on Monday then Tuesday is looking chilly again. Wind.. Brisk WSW winds today will shift to brisk NW late this afternoon which will then continue into Sunday. Winds diminish on Monday shifting back to the SE on Tuesday. Thunderstorms.. Slight chance of a thundershower today. Hazards.. wet driving conditions in any showers/thundershowers today. Brisk cool NW winds on the weekend will give a heavy surf along the north shore. Today.. Mix of sun and cloud, chance of a shower/thundershower, brisk WSW winds, highs muggy 23 then falling sharply late this afternoon. Don’t get caught outside on shorts and T-Shirt. It will be cold by suppertime. Tonight.. Cloudy with chance of showers/thundershowers early then clearing. Brisk NW winds, temps falling to 8 by early this evening then holding steady overnight.